Among the shorts presented by Turner Classic Movies between its feature films are tributes to actors who are being spotlighted on a particular day or during a particular month. Recently I caught a tribute to Robert Ryan narrated by Ernest Borgnine who worked with Ryan in three films — "Bad Day at Black Rock" (1955), "The Dirty Dozen" (1967) and "The Wild Bunch" (1969). Ryan, who died in 1973, was a childhood favorite of mine. 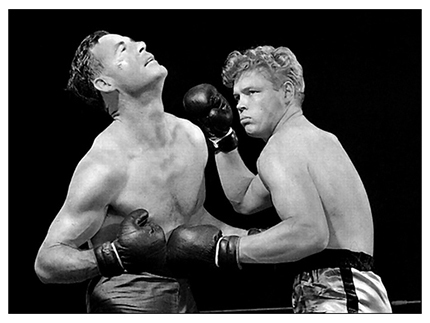 My appreciation of the actor's work was firmly established by "The Set Up," a 1949 release that I consider the best boxing film ever made. Ryan played an over-the-hill heavyweight, the kind of fighter often derisively referred to as "the opponent," which means a guy with a recognizable name who will look good on the resumes of an up-and-coming boxer. Basically he gets paid to lose, though it's usually unnecessary to fix the fight because "the opponent" has reached a point where he lacks the will and the ability to win. So it was in "The Set Up" when Ryan, as Bill "Stoker" Thompson, stepped into the ring to fight young Tiger Nelson (Hal Baylor). "Stoker's" manager (George Tobias) made a deal with local mobsters that his fighter will take a dive, but kept it to himself. Early in the fight "Stoker" realizes he can beat Nelson and between rounds tells his manager, who strongly advises his fighter to curl up on the canvas and take a 10-second nap. What happens next? Well, I suggest you watch "The Set Up" at the next opportunity. Both Ryan and Baylor (left and right, below) had actual ring experience. During Ryan's days at Dartmouth, boxing was a popular intercollegiate sport. Whether he competed against other colleges, I don't know, but biographies of the actor claim he was the Dartmouth heavyweight champion for four years. Baylor, a familiar face in movies throughout the late '40s and 1950s, was born Hal Brittan, but fought professionally as Hal Fieberling, which seems a strange choice for someone who had two catchier names at his disposal. He won 52 of 60 fights as an amateur, and 15 of 23 as a pro. Ryan chose an unusual boxing style for the movie, having "Stoker" bent over most of the time, ignoring jabs in favor of roundhouse punches with both hands. I can't imagine he fought like that at Dartmouth. HOWEVER, that has nothing to do with this piece, which was written because the TCM tribute jarred my memory about the day I met Robert Ryan in Newport, Rhode Island, in 1972 when he was filming "The Man Without a Country" with Cliff Robertson and Beau Bridges. Most of the interviews I had with entertainers were conducted over the telephone. Many others were conducted in restaurants over dinner or lunch. Others were conducted in an office, TV studio or dressing room. Then there were a few — a memorable few — which the subject and I conducted by the seat of our pants. Which finally gets me to Robert Ryan. He was the only actor who ever turned to me when he needed a ride. I had met him at his hotel, he needed to be several blocks away for filming aboard a schooner called The Bill of Rights. I apologized to Ryan, but he flashed a slight smile and said he didn't mind. The actor was 62 at the time, but looked much older. He obviously was grieving the death of his wife of 33 years, Jessica Cadwalader Ryan, who had died of cancer a few weeks earlier. But I was certain Ryan's condition went beyond depression, though I didn't suspect he, too, was dying of cancer and would pass away a year later. FRANKLY, it wasn't much of an interview. I felt I was imposing on the man, who thanked me for the ride, then went to work. Along the way he said little about his life or his career, except to dismiss the latter as "mostly crap, with maybe five worthwhile films." That certainly was a harsh judgment, though Ryan, of course, couldn't look at himself the way the rest of us did. He played mostly bad guys, though he was handsome enough to play the hero, too. However, Ryan's heroes — in "The Set Up' (1949), "On Dangerous Ground" (1952), "Inferno" (1953) and "The Proud Ones" (1956) — were severely flawed individuals. He had a frighteningly sinister smile; villainy flowed quietly and effortlessly from his speech, his manner and his gestures. He usually underplayed his parts, especially in contrast with actors such as Kirk Douglas, Marlon Brando and Rod Steiger. His outstanding performances as a bigoted soldier who commits murder in "Crossfire" (1947) guaranteed he'd be offered similar roles for the rest of his career. Off-screen he reportedly was one of the genuine good guys, a liberal Democrat who remained true to one woman as well as to his ideals. But I sensed he was a difficult man to please. TWO BITS of trivia: Ryan and his wife owned and lived in an apartment at the Dakota in New York City and eventually sublet it to a couple of folks named Yoko Ono and John Lennon, who purchased the property after Ryan's death. 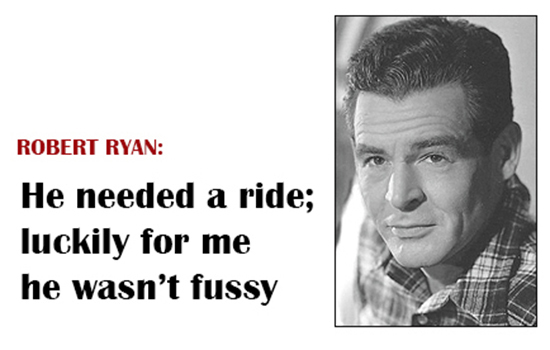 Second, about 30 years after my meeting with Robert Ryan, my son, Jeffrey, also gave a celebrity a ride to work, but his was a more glamorous assignment. He was working as a production assistant on "The Edge," a Fox comedy series, and one day his task was to pick up one of the show's stars and deliver her to the studio. Her name: Jennifer Anniston.